Summer has proven to be a busy season for Calvary’s employment program – Step Up DC. Step Up DC provides eligible women at Calvary with twice weekly job searching sessions, resume and LinkedIn help, and one-on-one support from Robinson Cook, our workforce development specialist, and two Step Up DC volunteers. Over the past year, the Step Up DC program has assisted 21 women at Calvary with securing both part-time and full-time employment, empowering them with a stable income and moving them closer toward moving out into their own homes. This summer, in addition to twice weekly job searching sessions, participants have had a few extracurricular opportunities made possible through our corporate partners. These special, one-time events for Step Up DC participants serve a few purposes. First, they inject new energy into the job search process, which can feel drawn out and frustrating at times for women at Calvary. They provide real opportunities to interact with working peers and hiring managers. Back in June, some of our friends from Deloitte came to Calvary for an Impact Day. As part of the day’s program, Deloitte employees held a question-and-answer panel for Step Up DC participants, where they discussed their own job searches. Deloitte staff also spoke about how it takes time and diligence to secure a job, no matter the position or company, and answered questions from women at Calvary about what that process was like for them. Panels like these benefit women at Calvary by showing them that struggles with motivation and confidence while job searching affect people regardless of industry or income level. During their time at Calvary, Deloitte employees also led a keyboard shortcut seminar for women in Step Up DC. Learning keyboard skills not only cuts down on the time women spend applying to online job postings, it also provides another skill that increases women’s confidence in computers and digital job applications. 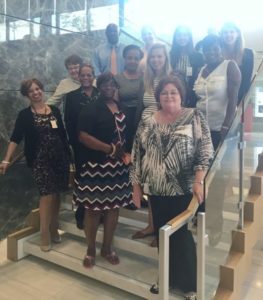 In July, women at Calvary had another unique opportunity provided by Hogan Lovells. Robinson and a group of women in Step Up DC traveled to Hogan’s downtown office for a day of special programming designed to introduce them to Hogan hiring staff and support staff in various jobs at Hogan. The day began with a presentation from the guest services hiring manager, who spoke about the hiring process and current openings. Women then heard from a Hogan attorney who spoke about how she planned for her interview at Hogan, and practiced her talking points in the mirror at home. This, like the panel led by staff at Deloitte, helps women in Step Up DC see their struggles reflected in people who have experienced similar anxieties and gone through the same preparations as they have while job searching, even if the career paths look different. It also helped reinforce the importance of the real activities that women are constantly engaging in while in Step Up DC; things like applications, reviewing resumes and networking. Next, women went on a tour of brief meetings with Hogan staff in positions that women at Calvary could see themselves having. During this tour, each Hogan staff member talked a bit about how they got their position and what their day-to-day looks like. 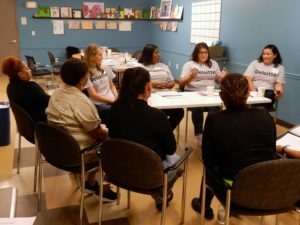 The tour served two purposes: first, for women at Calvary to build real relationships with people who have the types of jobs that they are applying to; and second, for women at Calvary to be able to picture themselves in those jobs in a real, humanized way. One woman from Calvary told the Hogan staff member she met in guest services, “You’re the woman I want to work with!” and she filled out an application for the position the next day. They see their peers actually in these positions and get re-energized in their own job searches. Additionally, women can then narrow down the types of jobs they’re interested in and tailor their job searches accordingly, instead of casting a wide net to any available position. Opportunities for women in Step Up DC to step outside of their comfort zones, hear from folks who can share their past struggles in job searching, learn new skills to make job searching and applications less intimidating, and meet face-to-face with peers in the working world are invaluable to the success of Calvary’s job development program. Developing confidence and motivation for women who have been out of the working world for anywhere from 6 months to several years is just as critical to their success in securing and maintaining employment as an updated resume and interviewing skills. We’re grateful to Deloitte and Hogan Lovells for partnering with us in empowering women as they work to find jobs, gain steady incomes, and build stronger futures for themselves and their families. To learn more about Step Up DC, click here. To support women at Calvary as they work to secure employment, please make a gift here.